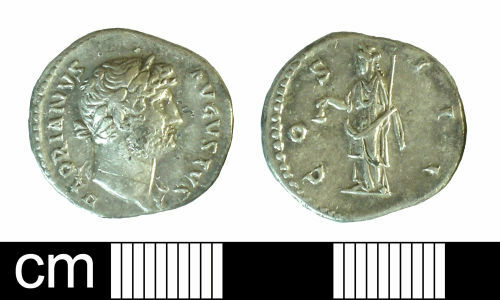 A silver denarius of Hadrian (AD 117-138); COS III (Libertas standing left) reverse type; minted at Rome, AD 125-128; RIC no. 175. The coin is in good condition, with little wear or corrosion. It measures 18.4mm in diameter, 2.6mm thick and weighs 2.97g. Reverse description: Libertas standing left, holding pileus and rod.